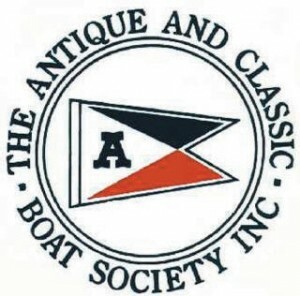 Antique and Classic Boat Society, Inc. – The Antique & Classic Boat Society is the largest society in the world dedicated to the preservation & enjoyment of historic, antique & classic boats of all types. 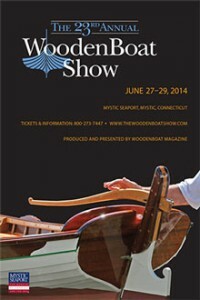 The Wooden Boat Show is the most dynamic wooden boat show in the country, with the premier American maritime museum Mystic Seaport. 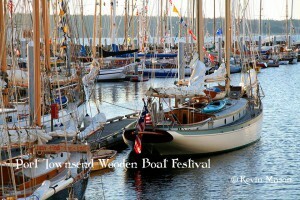 Port Townsend’s Wooden Boat Festival is the most education-packed and inspiring wooden boat event in the world. Featuring more than 300 wooden vessels, dozens of indoor and outdoor presentations and demonstrations, a who’s who of wooden boat experts and thousands of wooden boat enthusiasts, there’s something to do, someone to meet, or a boat to board at every turn. Expanded a little each year, the festival honors its traditions while inviting energetic debate and demonstration about the latest innovations in boat building, equipment, skills, and adventure. The New Hampshire Boat Museum is an educational organization focusing on the boating heritage and life on the lakes and rivers of New Hampshire. We serve the local community and visitors by presenting exhibits and outreach programs, events, publications and hands-on activities. The Luna Preservation Society (LPS) is a non-profit organization dedicated to the restoration and preservation of the tugboat Luna, a National Historic Landmark moored in Boston, MA. 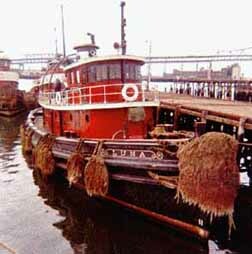 The Luna was the first commercial diesel-electric ship-docking tug of its kind and played an important role in the development of Boston Harbor. She is the last surviving full-sized wooden tug on both the Gulf and Atlantic coasts and is currently undergoing major refurbishing. 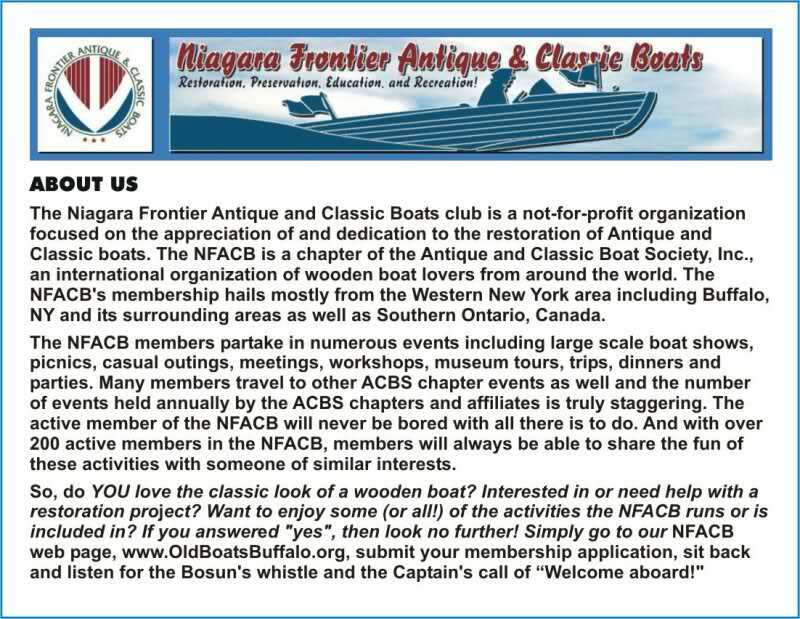 The Niagara Frontier Antique and Classic Boats Club is a not-for-profit organization focused on the appreciation of and dedication to the restoration of Antique & Classic Boats, and is a Chapter of the Antique & Classic Boat Society, an international organization of wooden and classic boat lovers from around the world. 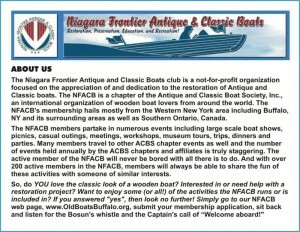 The NFACB’s membership hails mostly from the Western New York area including Buffalo, NY and it’s surrounding areas as well as Southern Ontario, Canada. The Catboat Association is an association of like-minded sailors, bonded by the pleasure of sailing a craft, which loves the wind, and relaxing on a quiet summers afternoon with friends. The association is a registered non-profit (501 c3) with fourteen hundred members in six countries. The Cape Cod Maritime Museum is a nonprofit organization based in Hyannis, Massachusetts, Cape Cod’s first museum dedicated to the maritime culture of the area. 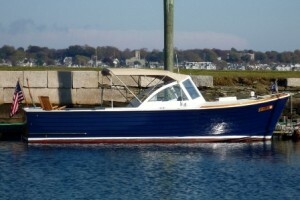 Our mission includes preserving the rich maritime traditions and history for which Cape Cod and the Islands are famous through our exhibitions, the objects in our collection, public events and educational programs, we strive to enable audiences of all ages to understand and enjoy Cape Cod’s maritime culture. Maine Maritime Museum celebrates Maine’s maritime heritage and culture in order to educate the community and a worldwide audience about the important role of Maine in regional and global maritime activities. The Museum accomplishes its stewardship through: discriminate collection, preservation and dissemination of historic materials and information, engaging educational programs, relevant and compelling exhibitions, and a unique historic shipyard, all connecting the past to contemporary and future issues. 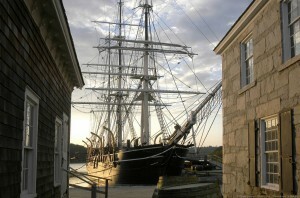 Mystic Seaport is a museum that strives to inspire an enduring connection to the American maritime experience.